Have a look at Weh Island on the map. It’s located between India, Malaysia, and Indonesia. This is what makes the culture, and the minds of the locals, so special. You will feel it when you are there. Pulau Weh belongs to the Province of Banda Aceh, which is a Muslim region. But you will perceive a wide rainbow of colors during your trip. 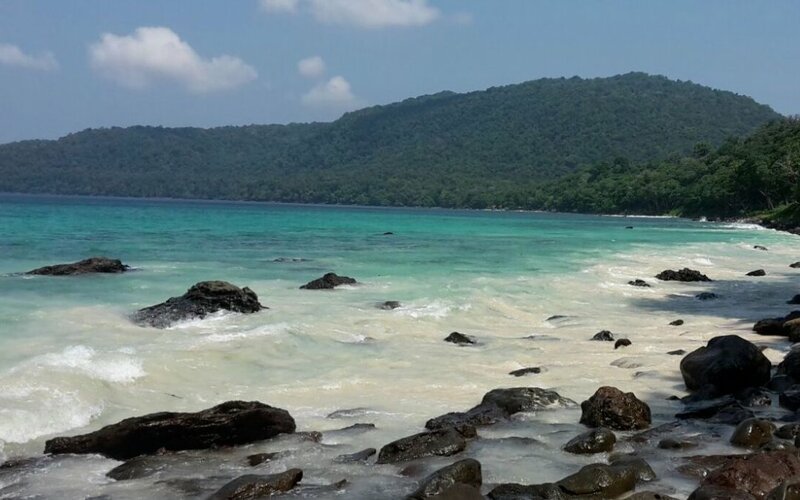 And you’ll understand why Pulah Weh is so attractive that many travelers who visited decided to settle there. The international flights in the airport of Banda Aceh, only a ferry ride from Sabang, will allow you to enter and leave the country as needed. Scuba diving was the primary reason that brought me to Pulau Weh. That’s what my divemaster friend on Pandan Island (in the Philippines) recommended. I asked him if he knew any place in Indonesia with wondrous dive sites at a reasonable price. His swift reply: go to Sabang in Sumatra! Keep reading to learn what are my favourite diving centers on Weh Island. 1 Explore the island with a motorbike. If you don’t know how to ride one, hitchhike from beach to beach. Locals are very friendly and there are always a number of people going up and down the island. There are three main beaches you can check out for a stroll: Gapang Beach, Iboih Beach, and Long Beach. Each of them has a different vibe and different activities but you’ll find accomodations on all of them, and foodies. Long Beach is the most relaxed. 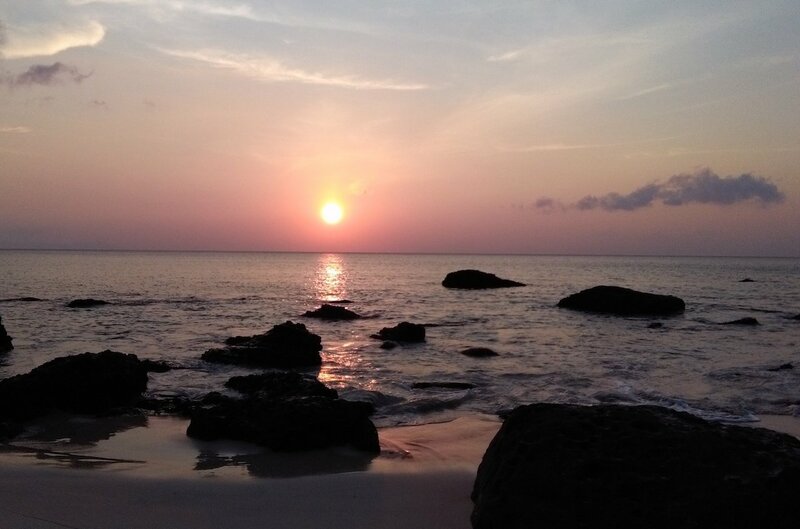 Iboih Beach is the place where everything happens, it’s especially dynamic in the evening and at night. They are all a few minutes’ motorbike ride from each other. During your ride (I’m afraid the sun is too hot to walk the distance, and there’s no shade on the road), enjoy the view of the sea. This is my favorite view on Weh Island. Past the three main beaches, the gets steeper and you will see it to your right! It’s impossible to miss it. That’s where I took the photo. From there, you could hike down to the sea and take a left: keep walking among the rocks until you reach a crystal clear lagoon perfect for snorkeling and for pretending you’re on your own private island. To reach the Monster Divers, head to Gapang Beach. The shop was founded by 3 Spanish men and an Indonesian woman. 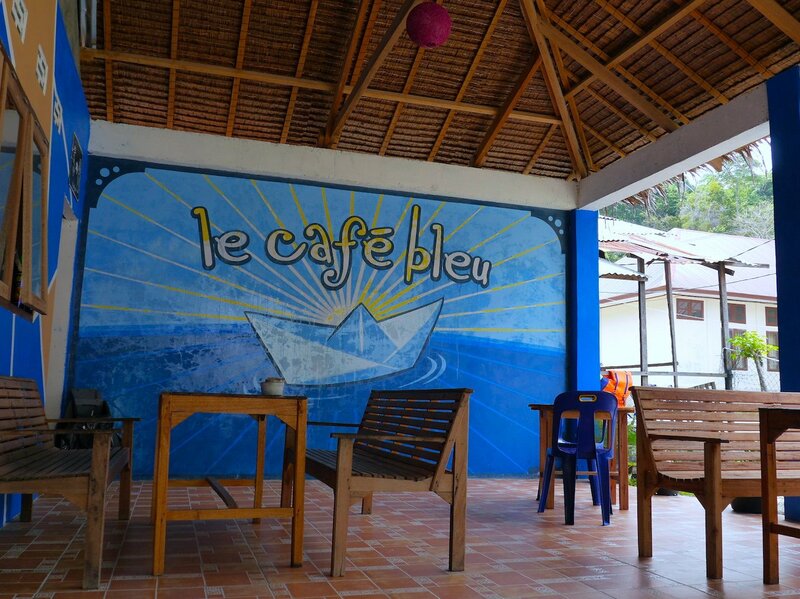 You want to dive here if you are looking for an easy-going community which will make you feel at home and share wifi and tea/coffee in the morning. They will also help you find a budget accomodation, if there’s one available. 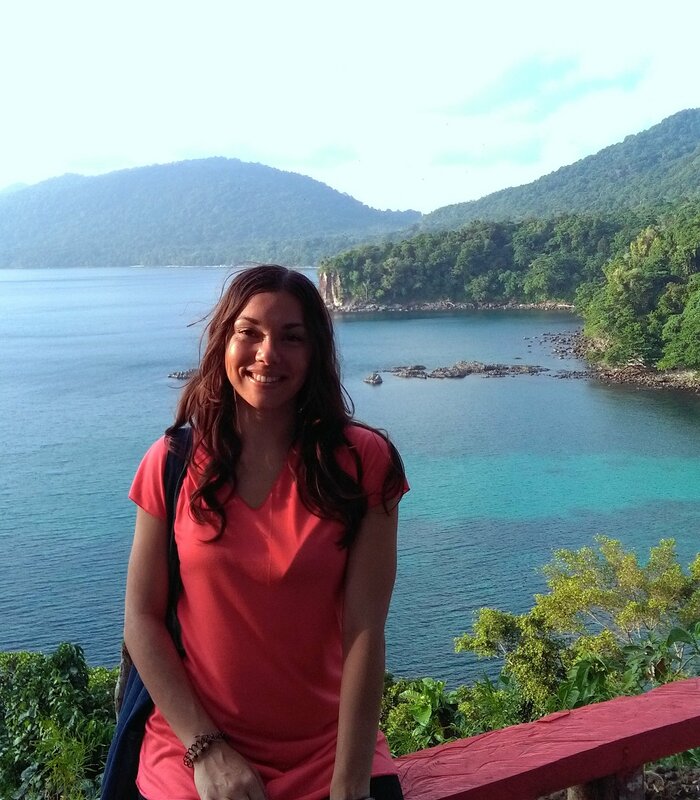 This diving center on the quiet, romantic sands of Long Beach is run by a Malaysian diver with extensive knowledge of the island and the sea. You want to dive with Steffen if you are looking for relaxation above all. Right in front of the center is one of the most popular diving sites of the island, “Batee Tokong”. Steffen has accommodations too, and a restaurant. It takes 10 minutes to hike down to “Secret Beach”. You will find a path between the bushes, on the right side of the road going from Long Beach to the viewpoint. It’s easy to spot the path: as sunset approaches, people leave their motorbikes on the side of the road and go down to enjoy the mystical colors of the landscape. Secret Beach in Pulau Weh is a stretch of white sand with a few trees for shade, and it’s surrounded by rocks. There is no shop or house down there, it’s all nature. You are still able to see fossils and corals brought on shore by the Tsunami of 2004. The locals remember. This is one more reason to visit and support Weh Island. The road from the main beach areas to Sabang town is a little adventure by itself. A 30-minutes ride with stunning views of the sea and the coast. The road crosses jungles with majestic trees, and at one big turn, you’ll meet the local monkeys. They are waiting for fruit to snack on or… to steal! I would never stop there, they come too close and are aggressive! On the way to Sabang, the locals sell fruit, run small restaurants that you might want to stop and check out, and there are a few mosquees. In Sabang, there is a nice fruit market with all the papaya and the fish that you’ll ever need to be happy. 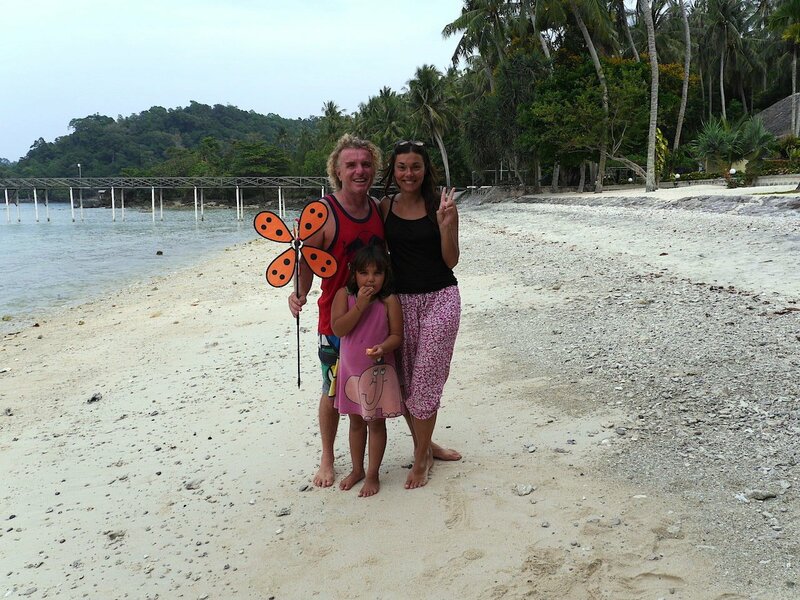 Sabang has a town/market vibe that you’ll need for sure after a few days on the beach. 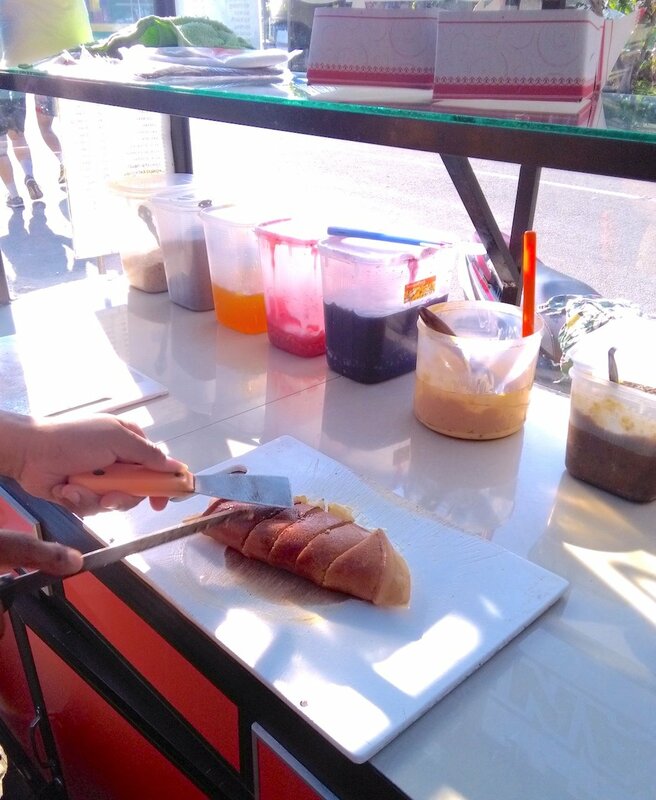 Or maybe just because you want to try the local street-food dessert, “martabak“. Iboih beach is the hub of the localnightlife (hey, nothing too loud or crazy here on this tranquil Muslim island!!). Cafes and restaurants and a few souvenir shops. It’s easy to connect with the locals and other visitors here. There are also dive shops and small markets, atms, and all you need to feel “social”. I’ll reveal my favorite places on Iboih Beach in a bit. I can’t say it too many times: it’s impossible to feel lonely on Pulau Weh! The friendliness of the locals and the sense of community that can develop here, it’s really something to consider. If you need a hack on where/how to make friends on Pulau Weh: take a snorkeling trip with a dive shop, eat dinner at Norma’s, visit Monster Divers in Gapang Beach and start a conversation with one of the owners, the spend the evening at a cafe on Iboih Beach. There are a couple of questions you wanna ask yourself before looking for or booking accommodations on Weh island. Do you want to spend most of your time by yourself, seeing as few people as possible? If you want to feel a little bit secluded, look for your bungalow on Long Beach or Gapang Beach. On Long Beach, check out Panorama, Steffen Sea Sports and Bixio Cafè to book your bungalow on the beach. For an even more secluded stay, book yourself at the Stone Park. Are you quite social and also a bit lazy and would love to have many restaurants and cafes very close to where you sleep? In this case, find an accommodation on Iboih Beach. Eitherway, the options are not exclusive and everything is within a few minutes’ motorbike ride. It’s very easy to find accommodations for any budget after you reach Pulau Weh. Perfect for for a cummunity feeling and the chance to share and chat with other visitors: be there at 7 for a simple but tasty buffet dinner on a big, long table, eating all together). For vegan food and wifi, and it’s right on the beach! The Italian restaurant on Pulau Weh! Serious! You can have lasagna here, and gnocchi. The founders are an Italian-Indo couple. Come here to eat and speak Italian. And they have accommodations. The easiest way to get around is by motorbike. If you like to go exploring everyday, rent one at the harbor after you have arrived by ferry. You’ll give it back right before you live the island. I’d definitely do this next time. In my experience, some Southeast Asiancountries aren’t very strict if you overstay your visa for just a few days. In the Philippines and Thailand, this was the case for me. However, I recommend you do not overstay in Indonesia if you leave from Banda Aceh airport!!! I enjoyed Sabang so much that I overstayed 3 days. The result? I had to pay $50/day fees! But all the atms at the airport were out of order! The border officials didn’t care abt the fact the atms were unusable, and they didn’t mind if I missed my flight to Kuala Lumpur. Luckily a guy from Germany helped me out this time. Bless him! Oh wow – another island to add to my list! Indonesia fascinates me. It’s great to read a post about a place off the typical backpacker trail, thanks for sharing – great tips. I really hope to visit someday! Thank you, this island might make you never want to leave Sumatra! What beautiful photos! This place seems magical! This looks so beautiful!! so much to do! When one talks about Indonesia, generally Bali comes to mind. It was great exploring and getting to know about Pulau Weh through your post. This looks like a great trip. I’ve never been to Indonesia. The water looks amazing. Wow, thank you so much for this post! I have explored east Indonesia (Maluku & Raja Ampat), but had never heard of this island. You’ve sold it to me and I’ve now added it to my list of places to visit in 2019! Indonesia looks stunning and a beautiful place to visit. Your pictures really show what a beautiful place it is. Looks like perfect place to enjoy with friends. 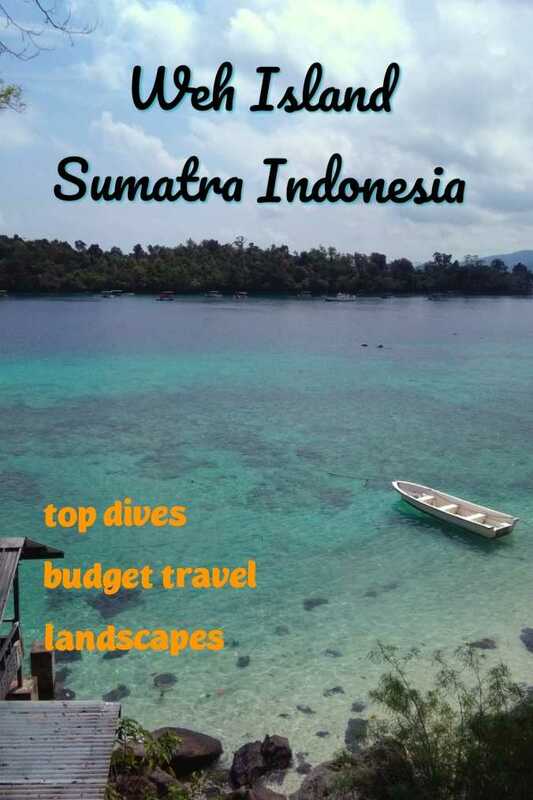 Indonesia is in our bucket list but not this place I am adding this place right away and also bookmarked this post too. There’s just something so magical about Asia. I love the rich diversity, culture, and food! Thank you for sharing your experience.! Indonesia is already on my bucket list but you made me want to visit it even more! Such a nice place to discover! I hope to travel there soon too! Going to the beach and making new friends is always good to add to the agenda. Travel this time of year rocks. That looks awesome! And so carefree and relaxed – MrsFrugalSamurai and I are looking to head over that way in 2019 – might swing by the Island now!